I want CincyCAMS to be going so well that I am "busy as a bee" running from class to class and setting up meetings, working with facilitators and flying all over the city - much like the bees work in their hives - with us all working together for a common cause! I want CincyCAMS to cause a "buzz" in the city - I want the thrill of thousands of adults making their own kind of music! Of course, I hate the word busy - I prefer happily scheduled, but either way - this is exciting work and I am loving it all. One of the goals of CincyCAMS is to collaborate and work with musicians, teachers, organizations, businesses and the public to make music happen in the lives of our adult neighbors and friends. This is a common goal of our arts partners - exciting work indeed! It is so very easy to get involved! Classes are short, but enriching - they are inexpensive, but valuable and most of all just plain fun and exciting to be part of this emerging culture of adult music enthusiasts in all areas of music! Our first class is starting this Saturday: "April Showers Brings May Festival" and we are thrilled. Don't forget to sign up for the British Invasion (May 4 or 6!). Where are those Beatles enthusiasts? 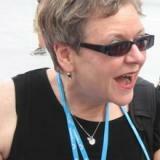 You will have a blast with facilitator Liz Archer - she is fabulous! Thank you to our friends at yp/CC Young Professionals Choral Collective and the ever fabulous KellyAnn Nelson and Christopher Eanes! They are helping us promote the British Invasion with their members and we in turn want you to know about their programs coming up! Check out our online calendar and check out their Community Sing on May 11, Spring Saengerfest on May 20 and a Washington Park concert on June 22 or take yourself out to a ballgame on August 26 and hear them sing the National Anthem. Good morning world and thank you for another day of rain - mess. My basement was not meant for all this rain! It occurs to me that most things in life we are not meant to deal with and if everything went along smoothly - then, well, where would the fun and the hot mess be? I am someone who thrives on more things to do and more drama than not. So, I should be happy that there is a slow start-up to our new business! Well, I should be, but I am getting slightly nerouvs that we are planning a party and no one is going to come! So, readers - if you are reading this - truly - there is someone you know who would enjoy one of our first three classes: April Showers Brings the May Festival, the 4-part a cappella men sing-in and the British Invasion! These are terrific classes taught by some uber terrific people in great spaces - and it's affordable! It is easy to register it is going to be a great time and we really need these first three to "go"! Thanks for reading - sign up and get your people to sign up! See you out and about! We Are Open for Business!!! Scared, Excited, Nervous and Proud! It's happening and we are open for business! The first two classes have been created and are scheduled! If you want to know everything going on this season with the May Festival - found out with "April Showers Brings May Festival". Or, if you are interested in "A Taste of Hamrony" sign up for the first 4-part male sing-in! You can read everything online in the Spring Schedule section. The first class begins March 29 - so, we need people! You are people - you can get other people right? I hope so! Here's our official press release - it's afun press release to read! Now I have to go take some nerve pills! The Cincinnati Center for Adult Music Study, a unique music education opportunity focused entirely on music and adults, is set to open. Founded by Rachel Kramer, pianist, teacher and arts administrator, and her business partner Mary Chaiken, CincyCAMS will offer programs on all aspects of music in multiple venues around the greater Cincinnati area. Programs will be facilitated by leaders in the Cincinnati music scene. The first classes will start <date>. Program offerings will change on a quarterly basis. Unlike other area music education programs, CincyCAMS will cater to adult students exclusively, tailoring program offerings and schedules to their interests and busy lifestyles. Programs will include lecture-style classes, small performance groups and instrument instruction. There will be something for everyone from beginners to experienced musicians, from emerging professionals to retirees. With years of experience in the Greater Cincinnati area music community, Rachel knows just the right person to facilitate each class. You have transcended the ingrained doctrine, characterized within a large percentage of the more formalized music community, that learning about music can only occur within the context of, and your relative success is measured by, a degree of 'perfection' you attain performing on some musical instrument - as determined by some assemblage of MMGs (mystical music gods). (I like) your use of the "switch board" strategic design in a manner that: 1. funnels people in, 2. nurtures them via a clever means of self-classification /trial participation, and 3. shoots them out into a community rich in music/arts activities; however, you provide them with a guide, and owner's manual of sorts, and finally 4. keeps them involved (hopefully). "Cincinnati Center for Adult Music Study is something totally new to the music teaching community and is attractive to adults of all sorts,” says Marie Krulewitch-Browne, ArtRx Manager at ArtWorks. “Having the opportunity to bring music enthusiasts together in unique ways is exciting for Cincinnati and for young emerging professionals like me." "As a member of the music industry and a Cincinnati native, I am very excited about this new way to reach adult music makers” says Kevin Cranley, President, Willis Music Company. “We know from industry statistics that adults make up a larger and larger segment of the music student population. Cincinnati Center for Adult Music Study will help adult music students reach their goals in fun and exciting ways." For more information, visit the Cincinnati Center for Adult Music Study website CincyCAMS.com, call 513-400-4368, or send an email to cincinnatiadultmusicstudy@gmail.com. Are You Part of the 70%? In a recent post on a friend's Facebook page - I saw the quote: 20% of kids take music lessons and 70% of adults wish they had! There isn't one adult person I have met, well maybe one or two, that really don't like music. I can't imagine that they really don't like music - I doubt that there is much to dislike - it's about knowing more - engaging and participating. We are putting together our first class offereings - we hope there is a little something for everyone! Maybe you have always wanted to try a little 4-part a cappella singing? Maybe you want to know more about the "British Invasion" of rock and roll - not 1776! And, maybe you just want to keep track of what we are doing! Mary and I have met with so many people and we have so much support for what we are doing! It is keeping us going! Keep an eye on things and get yourself out of the 70%! I am so excited to see our CincyCAMS website and Facebook page up and running, and to be receiving all your support and feedback. It’s hard to believe that it was only 5 months ago that Rachel first pitched this idea to me. Actually, this wasn’t the only idea Rachel sent my way when she heard I was looking for new opportunities (that’s not surprising—Rachel is bubbling over with ideas all the time—just take a look at the list of CincyCAMS programs for proof). But CincyCAMS was definitely the project for me. There’s so much going on in the greater Cincinnati music world, and Rachel knows so many of the people involved, I couldn’t wait to be a part of it. This week we’ve shared the vision with you. Soon we’ll be inviting you to sign up for classes and become a part of it, too. Judging from the pace we’ve set so far, it won’t be long! When I was little, my parents will tell you that I never wanted to leave the room when "grown-ups" were visiting. I thought I was a "grown-up" too. I have always migrated toward older people and have always been interested in teaching and working with adults. When I was a graduate student at the University of Michigan I ran the adult group piano program. When I came to Cincinnati to work at Baldwin Piano & Organ Co. I insisted that we start an employee piano class. When I went to work at MTNA (Music Teachers National Association) I was the representative to the first Recreational Music Making for Adults conference in Wisconsin. I am teaching group piano at Wilmington College, both to students and to the faculty and staff. Anyway, I love teaching adults - I love the joy they find in even their first accomplishment - I love the passion they have for finding out information about how music works and how composers write music and the sheer excitement of seeing them make their own music. So, always in the back of my mind has been the idea that I would someday have a "grown-ups"- only music program - a place where adults - young and old - could come together and make their own kind of music. I know that adults are busy and so I also know that it can be frustrating not to learn anything in the first class - so we have designed workarounds for that in hopes more people will make music faster. We also know that there are lots of adults who already study with great teachers here in the tri-state area - so we are offering programming that can be "ancillary" to current lesson study - classes that will enhance their experience - not replace. We also know that lots of people like to sing and play - but don't have time and can't find other people - so we have created an entire series of "Ring, Sing and Play-Ins" - people will come together in one day to make music together. "What About Mary?" (not the movie - Mary Chaiken). For 18 years I was the Associate Director and Accompanist for MUSE, Cincinnati's Women's Choir and Mary Chaiken is an Alto I. In August, 2013 I retired from MUSE and my last duty was to play for auditions. Mary was there representing the Alto I's and she said that she was leaving her career/day job - Cancer Researcher (PhD Molecular Biologist) - I can't even spell all that - let alone know what it is - but, nonetheless, Mary said she was looking for something new in her life - ahah - my moment - I asked her if she wanted to start this with me and sure enough - she did! My lucky day! Mary is great - she keeps things sane and organized and let's me dream. So Mary and I are off on an adventure - CincyCAMS - we are excited, nervous and hopeful that everyone will love it and flock in! Here's to a great time and wonderful music making! See you soon! Cincinnati Adult Music Center Launching Soon! We're all celebrating! Cincinnati Center for Adult Music Study is about to launch! CincyCAMS is more than lessons for adults! It's about making dreams come true, it's about unlocking a passion for music, it's about connection and it's all about music! Classes, performing opportunities, meet-ups and more will be offered year 'round. You will want to check back often and of course sign up to be on our mailing list! Classes will not be more than 6 weeks long and will meet in venues all over the tri-state area! Classes are unique and on topics not normally presented. There will be performance opportunities to drop in to sing, ring and play! Literally, there is something for everyone. CincyCAMS has partnered up with some of the best Cincinnati has to offer - facilitators, teachers, musicians, friends, neighbors, and colleagues! We are raising our hands in cheer to what promises to be one of the best things coming to you this year! Join Our Mailing List! Call Us: 513.400.4368 Write to Us! (c)2014 Cincinnati Center for Adult Music Study, Inc.